The trading terminal, apart from common functional of trading and working with charts, provides automated trading with Advisors and graphical interface for managing positions and orders. The user can operate either on the terminal NetTradeX Advisors or simultaneously on both terminals - primary and secondary. Trade automation and analysis by creating trading robots (Expert Advisors), custom indicators and service utilities. 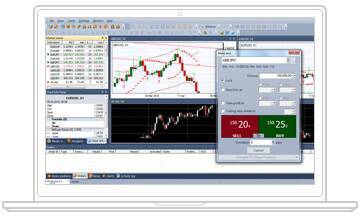 Graphical interface (visual trade) of opening positions, set and modification of orders directly on the chart of the financial instrument by the mouse. An integrated language of NetTradeX Advisors, which complements the functionality of the main terminal in terms of the implementation of algorithms of the automated trading. The user can perform basic trading operations in "manual" mode, for example, open and close positions, set up orders, use standard charts, add chart indicators and objects for the analysis of trends in the market.